Generations of quilters wish they had access to the modern quilting machines and quilting accessories available today through HSN. These quilting sewing machines and gadgets help make quilting easy and efficient, allowing experienced quilters and novices alike to enjoy this time-honored craft tradition. HSN proudly stocks combination quilting and sewing machines. 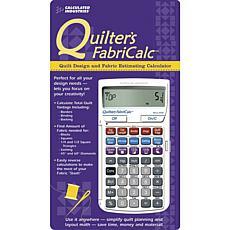 These have standard sewing functions with special quilting features like a larger work area, creative stitches, and thread-tension management. While standard sewing machines allow for basic quilting, the fabrics often bunch and the thread tension can be difficult to regulate. You're sure to notice the difference working on a quilting machine. 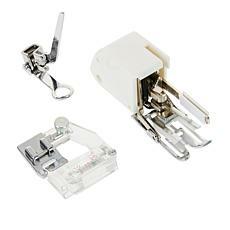 HSN's range of quilting accessories complements its quilting machines. Quilting stencils, layout grids, quilt-basting guns, and cutting and pressing stations to help you plan your quilting projects and bring them to life. Quilting machines are bulky items, but you needn't worry about large postage charges. For a limited time, HSN is offering a flat rate of $5 for all its sewing and craft purchases. That means you can buy a quilting machine, quilting equipment, and even needlework and cross stitch items, for example, and pay no more than $5 for postage. It's just another way HSN helps you save.